Elevation chart courtesy of Guthook’s AT Hiker app. He has apps for many trials including the PCT and CDT. Last night it rained pretty hard for about an hour around 10pm. The wind gusts were strong and it made what was probably a light rain seem like a lot more. I was cozy and warm in my ZPacks Soloplex tent, but I was worried about the strong winds blowing the rain in with the gusts against the front doors, so I doubled the protection and added support by opening my umbrella in the vestibule (see photo on day 2). I got audio of the rain so everyone can hear what it’s like. You’ll hear it get harder when the wind picks up too. Click here to hear the audio. Somehow I fell asleep to this and awoke and hour later to silence. In the morning, I woke up naturally at 6am. It just amazes me how I naturally wake up right around 6am. It was still silent, but within 20mins, the birds were really chatty. This only happens in the early morning so far. Click here to hear the audio from the birds as I packed up today. Yep, there’s a woodpecker in there too. I woke up still in a thick fog. 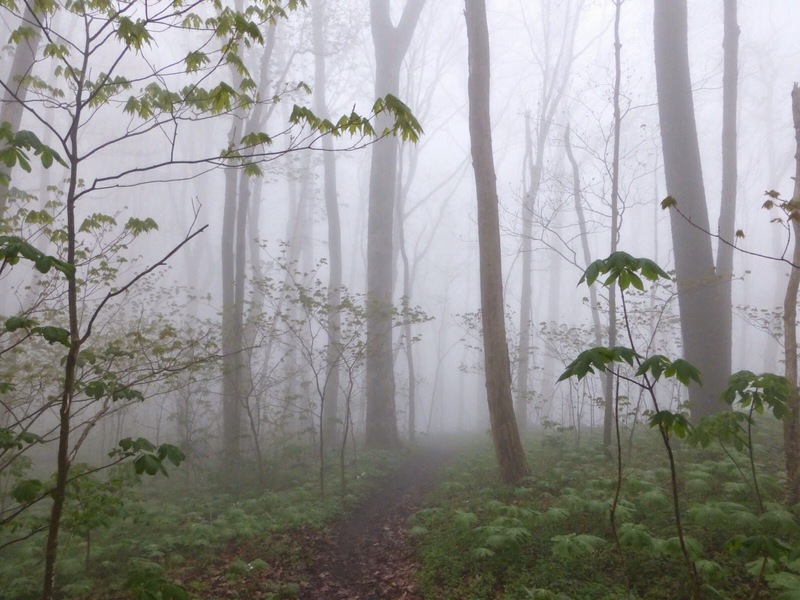 The sun tried to break through, but it was about an hour of fog hiking before it lifted. I started a bit late at 7:30am after loading the recordings and doing some emailing. Before the Smokies, I showed a picture of Stitch creatively using his Chrome Dome umbrella for wind protection and hitching. He also gave me another awesome suggestion. 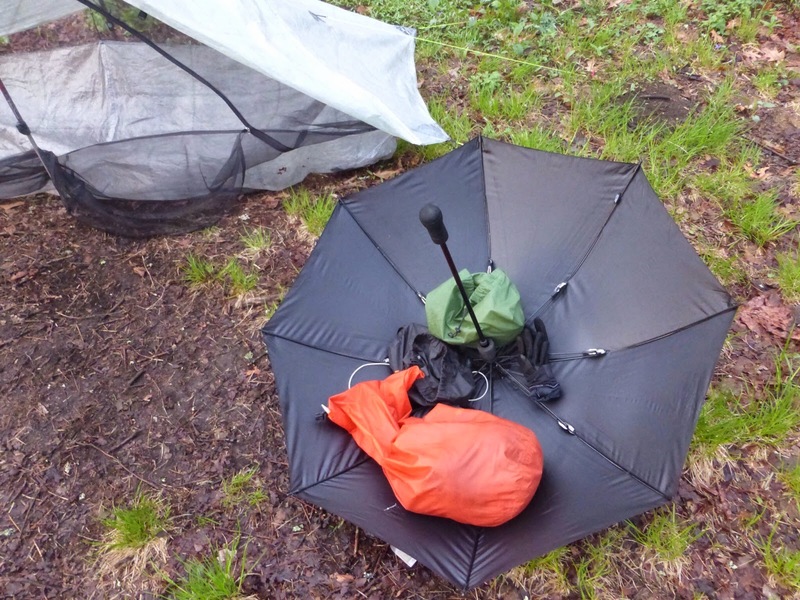 The umbrella is the perfect place to put stuff sacks in the morning when packing up on muddy ground. Worked great today! 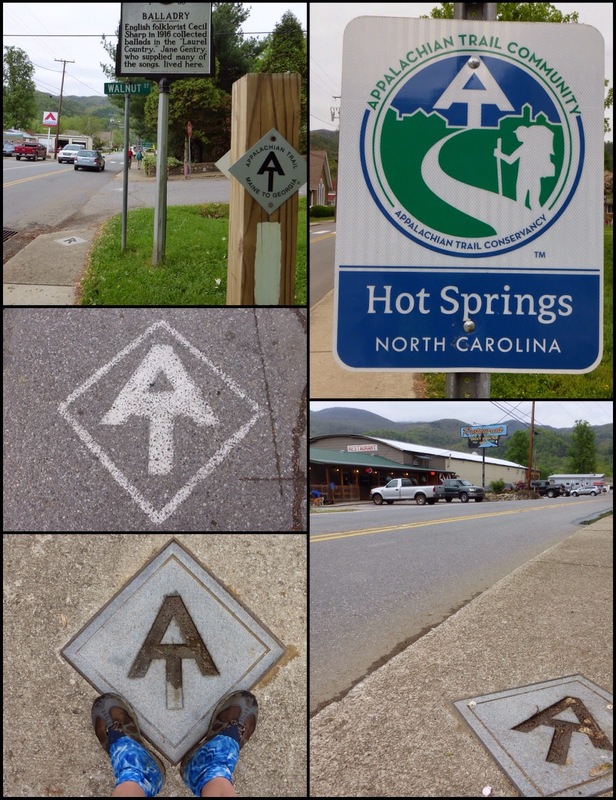 The morning hiking was a breeze as I did about 10mi mostly downhill to the town of Hot Springs, NC. 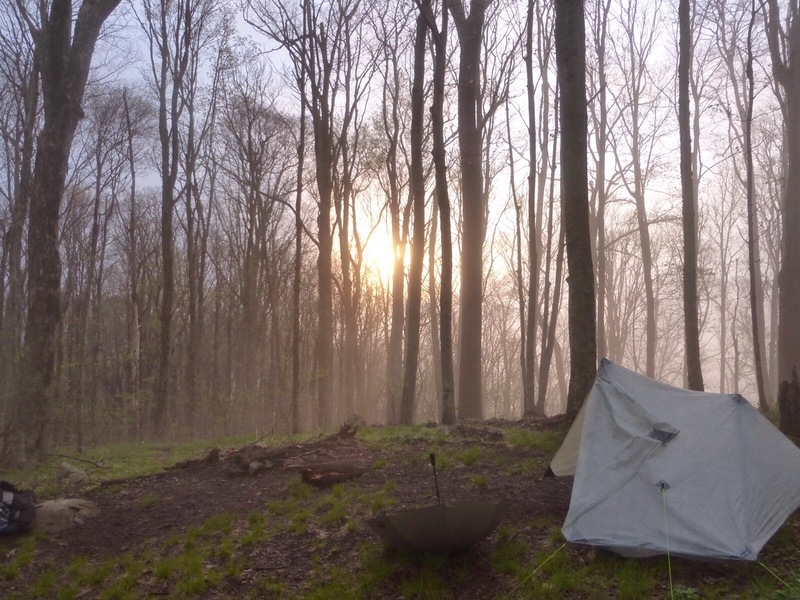 The AT goes directly through many towns and Hot Springs is said to be a favorite among hikers. I can understand why. 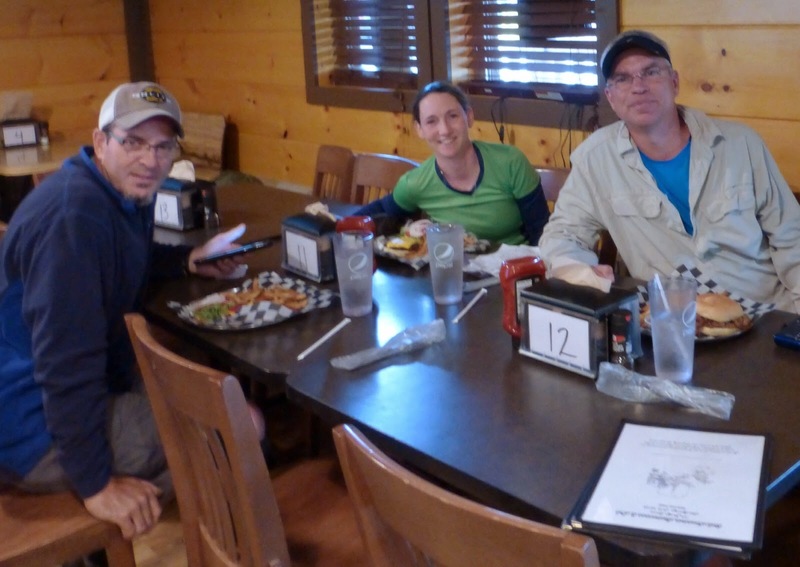 Right at the trailhead that welcomes hikers to town, there is one of multiple hostels. Soon the trail goes onto the sidewalk for less than a mile following the main road of this small town. The sidewalk had large AT emblems in it to guide the way and there were larger emblems painted in the road. I felt like I was on a hiker’s yellow brick road. The route through town also passed many historic buildings and that was cool. I’ve never been in a town that integrated a trail into their town so well. It was wonderful and actually made me emotional knowing how many trail towns I’ve been in on the other trails and none of them have felt this welcoming. As I walked through town it seemed like everyone was a hiker. They were everywhere! I passed a motel and out walked AZ Cruiser (from Arizona) and A Bear(last name is Ehbert). I met them a couple days ago an AZ had emailed me before the hike. We ate lunch together and I got to top off all my electronics while we all used the wifi while we could. I loved it and could get use to this town lunch and recharge routine! I also got to use a real bathroom, wash up, and throw away my accumulated trash. It was a bit longer lunch than I usually take, but totally worth it! AZ and I walked the next 11mi together to a shelter where A Bear was going to meet AZ. AZ is a wonderfully giving man. His father passed away somewhat recently and in his honor AZ is raising money for various charities through his hike and is going to match whatever he raises up to $10,000. 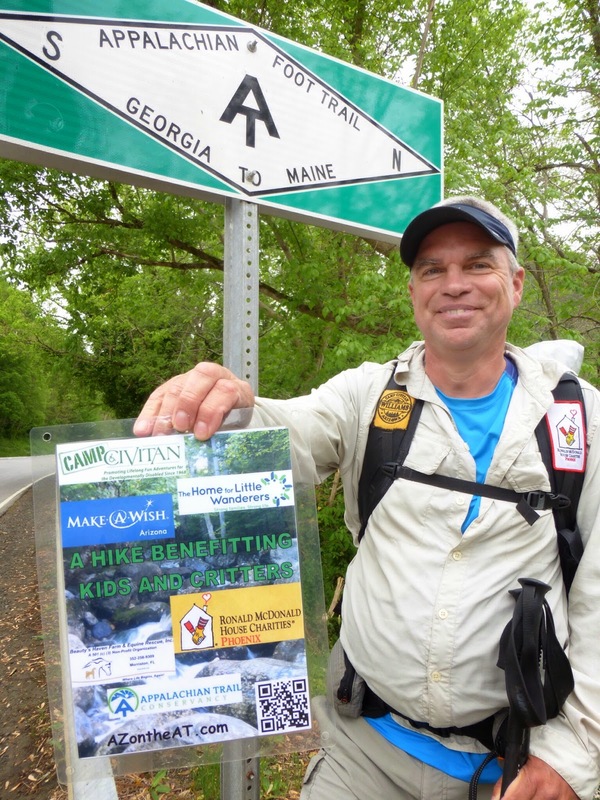 AZ seems to have been very inspired by his father to give back to the community and he has had a fortunate life so he is happy to have found a way to honor his father through the hike. The name AZ Cruiser also comes from the fact that his father was honored in Vermont with a ski trail named after him that has his name and cruiser after it. That’s why AZ added cruiser to his name. Here is a photo of AZ with his poster for his fundraiser (not for his hike) and his website is www.azontheat.com if you’d like to donate or read more about his mission. The scenery today was uneventful and forested. 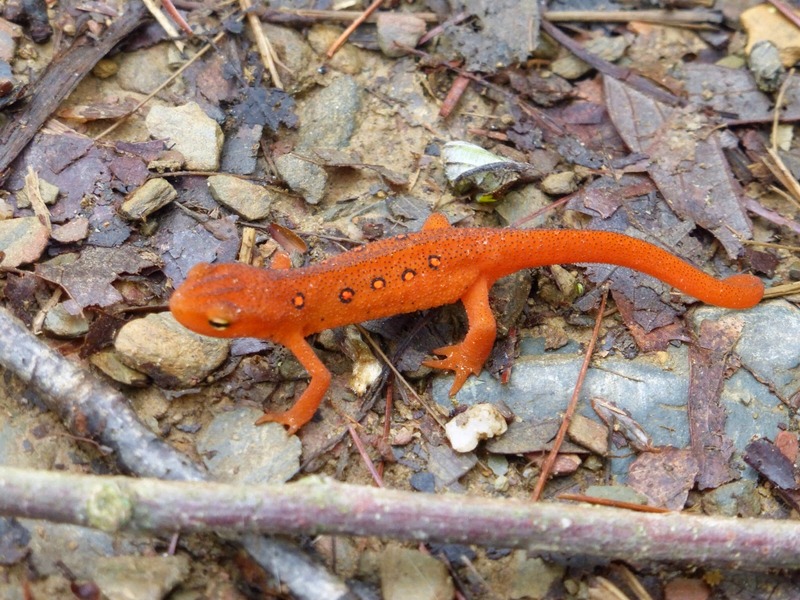 I did see what I’m told is some kind of newt which was really cool. Here are a few photos. I ended the day a bit earlier than I felt like stopping because the trail follows near a road soon after this with no suggested camping. I finished at 6:20pm and there is a mission group (YAMA?) thru hiking together that is also camped here. They do service and trail magic along the way and have a van for themselves and helping other hikers. I don’t like to camp at sites near roads, but I heard they’d be here so it’s safe. It was a nice day with cool temps in the low 60s which is perfect hiking weather. I’m too lazy to get out of the tent to take a picture of the campsite tonight, sorry. I can tell I’m gonna sleep really well!